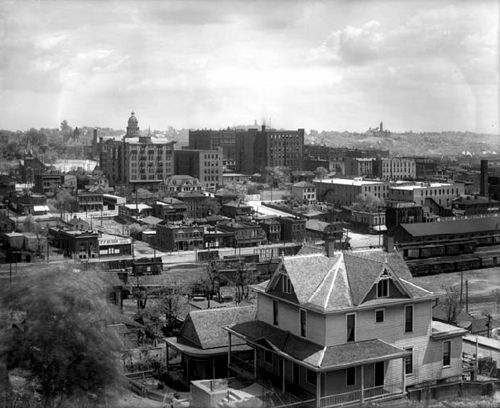 About thirty miles north of the Kansas City metropolitan area lies the historic city of St. Joseph, Missouri. It is here that the life of the Pony Express began and the life of Jesse James ended. Also known more familiarly as St. Joe, to the locals, this town got its start in 1826 when Joseph Robidoux, a local fur trader, established the Blacksnake Hills Trading Post with the Indians. Before long, Robidoux developed a trading empire that stretched as far west as the Rocky Mountains. The first post office in the area was housed in Robidoux’s trading post in 1840. When the Platte Purchase made his land part of the state of Missouri in 1837, the trading post developed into a settlement that was incorporated as St. Joseph on November 20,1843. Remaining relatively small, that all changed with the gold discovery in California that greatly accelerated westward migration. St. Joseph quickly became the last supply and jumping off point before the many pioneers headed towards the Wild West on the Oregon Trail. Thousands of settlers arrived by steamboat, while hundreds of wagon trains lined the streets waiting to be ferried across the Missouri River. In 1849 alone, some have estimated that as many as 50,000 pioneers passed through St. Joseph. The city quickly became a bustling outpost and rough frontier town, as covered wagons, oxen, and supplies purchased by the emigrants established the economic basis for the city. 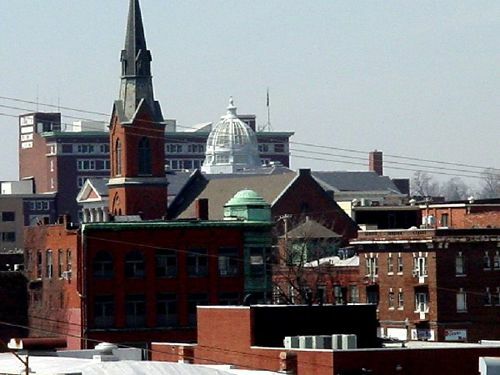 Additional growth came to the city in 1859 as the railroad pushed west to St. Joseph, further assuring its role as a distribution point for the west. St. Joseph remained the westernmost point in the U.S. accessible by rail until after the Civil War. Additionally, St. Joseph’s proximity to the Missouri River added to its phenomenal growth. In 1860, St. Joseph became the headquarters and launching point for the Pony Express. 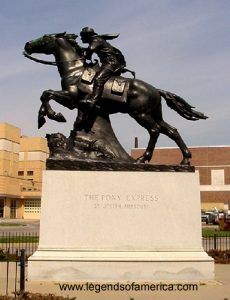 The first successful Pony Express run, from St. Joseph, to Sacramento, California took place on April 3, 1860, when a lone rider on a bay mare galloped from Pike’s Peak Stables in St. Joseph. Before the advent of the Pony Express, the railroads and telegraph lines extended no further west than St. Joseph, and mail traveled west by stagecoach and wagons, a trip that could take months, if it arrived at all. The Pony Express alleviated this problem with riders who could dramatically reduce the amount of time it took for the mail to be delivered. The Pony Express is credited with helping to keep California in the Union by providing rapid communication between the two coasts. News of the election of Abraham Lincoln to the United States presidency in 1860 and of the outbreak of the American Civil War in 1861 reached California via the Pony Express. While the Pony Express dramatically improved the communication between the east and west, it was a financial disaster for its owners. After the Pacific Telegraph Company completed its line to San Francisco in October, 1861, the company declared bankruptcy and closed down. By the 1870s, St. Joseph had become the wholesale center for the building of the West, which led to an age of prosperity. 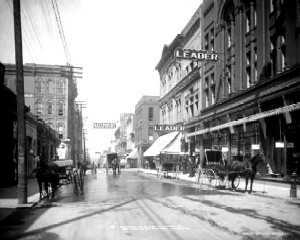 Numerous businesses were located in the city and beautiful mansions were built. In December, 1881, Jesse James made St. Joseph his home, hiding behind the alias Tom Howard. However, life was not to be a long and happy one for Jesse James in St. Joseph. Just three months later on April 3, 1882 Bob Ford shot Jesse James in his home. St Joseph – Louis C. McClure-1890. Courtesy Denver Public Library. In 1887, St. Joseph became the second city in the United States to have electric streetcars. Two years later, the city hosted the New Era Exposition, in hopes of being chosen as the site for a future World’s Fair. A disastrous fire destroyed much of the fair, caused financial ruin for its major backers and ended any hope of attracting a World’s Fair. By the turn of the century, the rush to the west was virtually over but St. Joseph had already established itself as a major livestock and wholesale market. St. Joseph, April, 2004, Kathy Weiser. Today, the city is called home to almost 77,000 residents and provides numerous historic attractions including several museums and numerous beautiful historic buildings and mansions. Jesse James – Folklore Hero or Cold Blooded Killer?